On August 6, 2010, I had the pleasure of visiting with Robert Dyson in Kelowna. Bob's father, Spencer, and my Mum's mother, Muriel, were brother and sister. Bob told us he was born in 1929 on the Hudson Family Ranch in Midnapore, Alberta. It is obvious that he has a deep appreciation of history, and as a youngster, spent time with older members of the Dyson family asking questions and finding out as much as he could about their years in South Africa. Granny had many stories to tell. She told him about where they lived in Zeerust in the Transvaal, and how the ladies could sing just like Marion Anderson. She said they always seemed to finish the height of the song just as they rounded the corner of the police house that she, Arthur and the children lived in. And when any of the prisoners escaped - the local gaol must have been attached to or very close by the police house - the guards had ropes that were about 4 feet long with large ball-shaped rocks attached at each end. The guards threw these ropes in such a way that they wrapped around the escapees legs and pulled them to the ground. This is how they were captured. One of the aunts told Bob that there were men's clubs in Zeerust and ladies were not allowed in. Arthur liked to go to the club after work where the men would gamble and partake of the liquor. However, Granny didn't put up with that too much; she'd walk right inside the club and he was soon on his way home! Arthur's father, Thomas Dyson, was a manager of the Bank of Bengal in India, and sent him to a private school to be trained as an accountant. The intention was that he would work in a bank as well. However, Arthur it seems was interested in a more adventurous life. Unfortunately, he did not live to a ripe old age. According to Granny Dyson, the family was walking down the gangplank to board a ship in Johannesburg when Arthur suddenly collapsed with what turned out to be a ruptured appendix. She said he was in such pain, it took 12 men holding him down for nearly an hour before he died. Granny left South Africa with the children and arrived back in Canada in July of 1910. Pioneer Families of Southern Alberta, book, 1993 publication, Pioneer Families of Southern Alberta produced under the direction of the Historical Book Coordinator, Jacob Lionel (Jay) Joffe and the History Committee at that time. "Dyson, Arthur Arthur was in Calgary in 1887. He was born in 1869 in India, and died in South Africa in 1910. He was married in Calgary, in 1892 to Florence Hudson, who was born June 19th, 1865 and died October 23rd, 1957, at Kelowna, B.C." submitted by daughter Mrs. Ella Ruth Cherer in the 1940's. I have managed to get quite a listing of Arthur Dyson's siblings through the Ecclesiastical Records of the Bengal Presidency (India) but cannot find out anything on Arthur himself. His mother, Emily Henty was born in India and apparently his father, Thomas Dyson went over as a single man and met her there. He was quite a bit older than her. The RCMP have confirmed when he joined the NWMP, where he was stationed, and when he left the force but I have to go to the National Archives to get anything further. Arthur Dyson is transferred to Shoal Lake, Manitoba. Hi James ,I was talking with my brother Bob today and he tells me that Arthur worked for 1st Viscount Alfred Milner after the Boer War in South Africa. There is a record of him going to the Transvaal and to Zeerust. Apparently Arthur, who lived in Zeerust at least when my father was born, also worked and/or lived in the Transvaal. We had always been told that grandfather worked as an administrator after the war and so perhaps there is something to this. I have spent several hours searching for your man with no luck. I have been through all the records at both the Archives in Pretoria as well as those at the Master of the High Court. If he died in the Transvaal, there would had to have been a file on him, even if just recording his death. I checked for a misspelt name under Dyason, Dyzon, Dison - all to no avail. There is a possibility that he was not living under his proper name or that he died outside the Transvaal and was buried in Zeerust or that the date of death is incorrect. The last is unlikely in the Transvaal as I enlisted the help of one of the senior officials in the offices and we covered the period 1874 to 1959 with those optional spellings but couldn't find him. If he had been ill and taken to hospital in Mafeking (which is not too far from Zeerust and is a larger centre), and died there, his death would have been recorded in the Cape Province. I can check their records when I get to Cape Town later this month. I guess he may also have died across the border in present day Botswana which is also very close to Zeerust. Sorry I don't have better news for you at present. South African National Archives On-line for Transvaal Province govt. documents ..
possible to take any steps with regard to your case. ZEERUST, a town of the Transvaal, 149 m. by rail, via Krugersdorp, N.N.W. of Pretoria and 33 m. N.E. of Mafeking. Pop. (1904) 1945. It was founded in 1868 and is the chief town of the Marico district, one of the most fertile regions of South Africa. In the neighborhood are lead, zinc and silver mines, and some 20 miles S. are the Malmani goldfields. The Marico Valley was occupied early in the 19th century by Mata-bele, who had come from Zululand. They were driven out by Boer trekkers in 1837. To Boer cultivation the valley of the Marico river owes its fertility. Wheat and oats are largely cultivated and almost all sub-tropical fruits flourish. Following the relief of Mafeking, 17th of May 1900, Zeerust was occupied by the British under General R. S. S. Baden-Powell. Railway connection with Pretoria was established in 1907.
current ? address in Zeerust where perhaps information of newspaper articles or cemetery listings might be obtained?? The very recently acquired birth registration of the 1886 birth of Amy Frances Ellen Dyson is more important that it initially appears as it further ties the elusive Arthur Dyson to the family of Thomas Dyson and Emily Henty.. The birth registration of Amy Dyson , which names the parents as being Thomas Dyson and Emily Henty, also states that Amy was born in "Norwood, Surrey"
"1886 Birth in the Sub-district of Norwood in the County of Surrey"
"Next of kin: Father, T. Dyson, Carberry House, Norwood, London, England"
This doesn't seem like much, but Arthur's links to the rest of the Dyson family have not been easy to document. 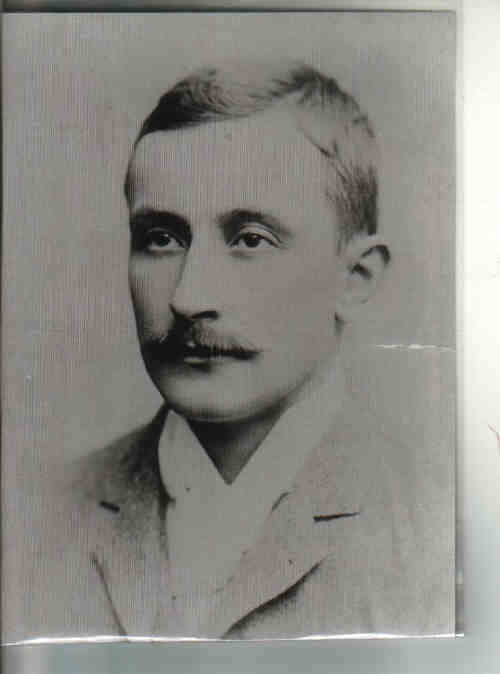 Since Arthur Dyson certainly isn't with his sisters at their private school, the question of where young Arthur Dyson is in 1881 has yet to be determined. He is likely around 12 years old and one would think that he would be in England near his sisters. It was common for children to safely reside in England to get a "proper" education while the parents remained in the British colonies. which would appear to be the marriage record for the above widow: Anna M Windle. So it is very reasonable that the Windle family knew the family of Thomas and Emily (Henty) Dyson in India and is caring for Arthur Dyson in 1881 in England. Examination of the marriage record of Joseph Windle and Anna Mary Walshe shows that Anna's father was a Minister of the church in Midnapore, Bengal India in 1868 and actually married the couple in the St. John's Church in Midnapore. Midnapore is located approximately 70 miles west of Calcutta. A search for church records in India turns up the christening record of Ethel Windle, daughter of Joseph Allen Windle and Anna Mary Windle for the 17th Dec, 1878 on the transcript of parish registers for the Presidency of Bengal. Which points out the mobility of these British colonists to India. Ethel is born in London, christened in Bengal India in 1878 and is back in London again in time for the 1881 census. In the meantime the husband Joseph Allen Windle dies prior to the 1881 census. I suspect that the William Dyson shown below on the 1891 census in Alberta is likely some relative of our Arthur Dyson as the daughter of his close neighbor (Florence Hudson) soon marries Arthur Dyson in Calgary in 1892. Perhaps Arthur was visiting William and met the 21 year old Florence Hudson. note by jca. so who was William Dyson, here age 49 and a Wool Factory employee.?? William Dyson, male, age 49, married, born England, parents born England, Church of England, occupation: Wool Factory Emp. Maud shows up getting married in 1905 to Robert George Eve. DYSON, Lillie Maud sp. Robert George EVE, F, marr:25 Nov 1905, Age 22, Calgary Reg 18-1971-0867H. Robert Eve - Calgary North. Age 29, born 1872 in England. Info from www.saskhomesteads.com where I found if I entered "Dyson" in the "remarks" section, it came up with 3 documents of interest. This shows that Arthur Dyson and Gerald Hope Dyson were both successful in getting the land grants they applied for but it looks like neither intended to come back to Canada anytime soon as they sold them. detailing his claim to his NWMP Buffalo Coat. • Occupation: Hudson's Bay Co, 4 Sep 1895, Calgary, Alberta. 64 A further request to the NWMP, Regina, from Arthur Dyson to receive his official discharge papers from the North West Mounted Police. Request was written on Hudson's Bay Co. letterhead, and address shown as Calgary. • Land Applications: Saskatchewan. 80 Sold South African srip land grant to Reuben John Arnold.